Marina offers a variety of harps that are available to rent. Click here to know more about Marina's "Harp A-Z" educational outreach program. Marina has been teaching students of all ages and levels since 2000. She is now part of the UNR and TMCC faculties in addition to operating a private harp studio. Marina believes that in order to be a well-rounded musician, one needs to engage in a variety of practices. Actively performing as a soloist and orchestral musician goes hand in hand with sharing musical knowledge and passion by teaching. To achieve a well-rounded musical education, students should ultimately experience a variety of musical aspects. 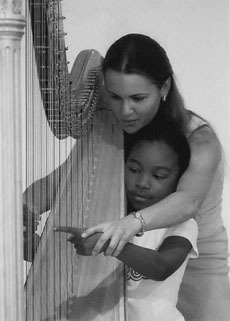 In addition to harp playing techniques taught, music theory, ear training and rhythmic exercises are an inevitable part of the learning process. Practicing performance skills is also encouraged among students of all skill levels, as music is meant to be shared with others. The earliest age to start harp lessons is typically five, the other extreme is unlimited. Indeed, it is never too late to accomplish your dreams. Previous musical experience is not required, but could be helpful for quicker progress. The goal is to enjoy learning to play this gorgeous instrument. Yvonne was the top winner of her school's talent show this year. Megan was a winner in the final round at the Rotary Music Competition performing Andre's Absidioles. In addition, Megan won the Concerto Competition at the Young Artist Harp Seminar, performing Debussy's Dances in Rabun Gap, GA.
Q: How can I take lessons with you? A: There are a several options here. I teach privately as well as at TMCC and UNR. If you are a UNR student, or simply a member of the community aged 18 or older and would like to enroll for credits, you can enroll for harp lessons at UNR. High school students can also enroll for college level credits (ask for more details at the UNR Music Department office). The benefit is not having to own or rent an instrument and being able to use the school harps to practice. Harp ensemble runs in combination with private lessons. If you would like to try the harp in a friendly group setting, consider taking the non-credit harp class through TMCC. This group class is the most inexpensive way to try out the harp. If you would like to have one-on-one harp lessons, please contact me for more details. Q: What is the earliest age to start? A: Each teacher has his/her own ideology regarding this subject. Some students start on smaller harps, while others start right away on the grand concert harp. It is possible for even a five-year-old to start on the grand concert harp, barely reaching the strings or the pedals. It is very good to have some training on piano and some understanding of music theory prior to taking on another instrument. A: I have enjoyed teaching all ages of students for nearly ten years. It is common for parents to take lessons along with their children, since there is already a harp at home, and enjoy learning from each other and playing duets together. Any age is welcomed, but adults may have to pack some extra patience when they decide to take lessons and prepare for things not to work on the first try. The beginners' harp class at TMCC consists mostly of adults from the community who enjoy learning in a supportive and fun group environment. Q: Do I need to have previous musical experience? A: Though helpful, previous musical experience is not a requirement. Due to the way the harp is constructed, the "black keys" (chromatic tones) become "invisible," as those are created by changing the pedals with the feet. Therefore, just like it is for a child that starts on violin, it can be harder to grasp the organization of pitches within scales and chord structure if one starts directly on the harp. My lessons include instruction on music theory tailored to the individual needs of the student. Q: Do I need to have a harp? A: Students will be required to rent or own a suitable instrument. 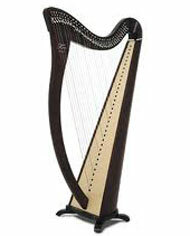 Renting a harp is very easy and quite affordable. For purchasing a new harp, I recommend Lyon and Healy harps, which are made in Chicago. Other top harp makers are Salvi and Camac Harps, which are made in Europe. Those are available at harp centers around the States. The other option is buying a used instrument from a music store (or in some cases, directly from a person). Please contact me for more information on renting or purchasing an instrument that is right for you. Q: What kinds of music do you teach? A: Learning the harp is a fascinating process for any age; my goal is to make it enjoyable for all. I am happy to adjust to the personal tastes and preferences of the students, whether the style is country, folk, rock, or classical. Fundamentals can be taught equally effectively playing Bach or Metallica. Q: Do I get to perform? A: While not a mandatory part of the curriculum, students are strongly encouraged to take advantage of the performance opportunities that will be offered to them throughout the year. If you suffer from stage fright and performing is not something you want to do, that is fine as well. There is also an option to participate in a harp ensemble with students of similar level, whether you are taking lessons through UNR or privately. Q: What is a "concert grand" harp? A: There are classifications for the different types of classical pedal harps. The main criterion for classification is the number of strings on the instrument. Modern harps which are used for stage performance in Europe, the U.S., and other countries have between forty (called "Petite") and forty seven strings (called "Concert Grand"). Q: What are the measurements of the harp? A: Concert harps are commonly about six feet tall (185 cm) and the weight is usually between sixty pounds (28kg) and eighty five pounds (40kg). Q: What are the pedals for? A: The harp has seven pedals. Unlike the pedals of the piano, which are used to control the muting or resonance of the sound, the harp's pedals are used to control the actual pitches produced. The pedals are connected with metal rods that go through the column of the harp to the top section, called the "neck." Each pedal controls the pitch of a group of strings. For instance, a C pedal is connected to all the C strings and is able to change those simultaneously into C-flat, C-natural or C-sharp. Each of the seven pedals corresponds to one of the seven notes of the scale. Q: How often do you tune it? A: The strings and wood of the harp are very sensitive to temperature and humidity changes. Usually, a harp needs to be tuned before each practice, unless the temperature in its environment has been extremely steady. If the strings are new tuning could be necessary during playing. When transporting a harp, especially in cold weather, it needs some time to get used to the temperature of the new location. Q: How do you tune it? A: Tuning only takes a few minutes for a skilled harpist. A tuning key is used in conjunction with an electronic tuner or by ear. Each string has to be stretched or loosened by rotating the tuning peg at the top of the string with the tuning key. This needs to be done for 47 strings! It's not as bad as it sounds. Q: Why are strings colored? A: The colors are necessary for playing orientation. The C strings are red and the F strings are dark blue, while the rest are clear or white. Since the spacing of the strings does not change throughout the scale, there are no other "landmarks" to help locate the pitches. The color pattern is standard throughout most of the world, though there are other types. The Paraguayan harp, for instance, has a reversed color scheme, where the C strings are dark and the F strings are red. Q: How often do strings break? A: Strings can break without warning at any moment, even the first time they are stretched (in the case of a defective string). Typically, strings start getting worn out and breaking after a year or two, this depends on playing load and the frequency of transporting the instrument. For this reason, it is advised by harp makers and regulators to change the entire set of strings and have the harp regulated every two years. Not everyone can afford the luxury of new strings and regulation every two years, so often this event is delayed until it is unavoidable. It is much better to change an entire set of strings at the same time, as their condition stays similar, rather then having a few new strings next to a few old ones, etc. By maintaining the harp and changing the string set correctly and frequently, you reduce the odds of a string breaking in the middle of a performance. Q: what if a string breaks in the middle of a performance? A: A performing harpist should always have an entire set of strings close by. While not a common event, it does happen a few times in the career of a harpist. We all have a few tales about strings breaking, as well as other onstage and offstage "tragedies." We use our best judgment, depending on the situation. If a string breaks during a solo performance, we try to finish the piece and then take a "flat tire" break. Sometimes the string is crucial for a certain piece and we choose to replace it and start the piece over. From that moment on, we need to be constantly aware of the new string and keep tuning it up at every chance. Q: What are the strings made of? A: For the best sound results, three types of strings are used on the harp. The bass strings (bottom twelve strings) are made of wire, the middle register sounds best with gut strings, and the top two octaves are usually nylon strings. Nylon strings are practical, as they are less sensitive to temperature change, last longer, and are much cheaper! However, the sound and feel of the harp is noticeably different if the gut strings in the middle register are replaced with nylon. For the professional harpist, this is not the place to compromise. Q: What other harps exist? A: There are many types of harps in the world, and most are used for the folk music of their country or region. Celtic harps and Paraguayan harps are common examples of such. They are smaller, have fewer strings, and do not have pedals. Instead, some of them have mechanisms for altering the pitch using levers, special tools, or the hands. Q: Are there electric harps? A: Yes. Electro-acoustic harps look just like the grand concert harp on the surface, but are equipped with pickups at the bottom of each string that allow it to be amplified. They usually come in non-natural wood colors like marine blue or deep green. The pedal mechanism is identical to the standard grand harp. These harps are used mostly by jazz players and other gigging harpists. Smaller electric harps also exist and are often used in the popular music arena. A: Another very recent invention is the computerized grand non-pedal harp. The creation of this unique instrument originated from a harpist who lost the ability to use her legs, but still had a strong passion for playing the grand harp. The pedal mechanism is controlled entirely by a computer programmed in advance to follow a certain piece and its pedal movement. Q: Why did I become a professional harpist? A: I love the harp; it is what I do. I think the harp is a unique and fascinating instrument. The more I learn about it, the more I grow to love it. The more you master any artistic skill, the more you become absorbed in it and come to appreciate the details and art in it. The harp is capable of being a melody and accompaniment instrument, a "one man band," as they say, just like the piano, but more complicated and interesting in my opinion. Since I began to study the harp, I couldn't see my life without it. I want to share my passion for this instrument with many others, that is why I love teaching and performing. Q: When and why did I start the harp? A: I started when I was twelve, captivated by seeing and hearing the instrument in a symphonic orchestra. The more I studied it, the more I grew to appreciate the beauty and magic of the harp. I thought it was the most gorgeous instrument of all, and my six years of piano surely made it easier to understand, propelling me forward in my musical progression. Q: How much do I practice? A: There is no definite answer on how much one needs to practice. What takes one student an hour to master might take another a week. The important thing to take into account is the learning experience itself. The intensification of one's self-control and passion for music is an accumulative process. For a performing musician, practice will take the majority of their time and energy. Many things can affect practice efficiency, including mental and physical condition, so every musician must have their own strategy for optimizing their practice routine. One thing is certain: nothing happens by itself, and no results are going to show without steady work. Q: Do my fingers get sore? A: It is very common for the harpist to develop calluses and even blisters from prolonged playing. This will depend on the sensitivity of the person's skin and on their practice habits. Usually, blisters occur as a result of a sporadic practice schedule, such as a sudden load of practicing after a long break. It is necessary to keep a steady practice routine to avoid painful blisters and other more serious injuries. Before an important performance, it is wise to replace a few hours of physical practice with mental conditioning and review, in order to save the fingers and hands from fatigue. Q: Do I play with my fingernails? A: Standard sound production on the pedal harp is accomplished with the cushions of the fingers, and not with the nails. Nails have to be kept short in order to produce a good tone on the harp. The nails are sometimes used as a special effect. The Paraguayan harp, for instance, is played mostly with the nails. Q: Why don't I use the pinky finger? A: Looking at the way the harp strings are plucked and the anatomy of the human hands, the fifth finger (the pinky) turns out to be too short to be used effectively. Therefore, we only use eight fingers when playing the harp! Q: How long does it take to become a professional harpist? A: As in any art or sport, becoming proficient takes years of training. Everyone has their own pace, and knowledge of a related subject or skill can certainly affect the speed of learning. Talent is also important, but it will not do the work for you. One needs passion and dedication to the subject to have the patience necessary for putting in the work. Depending on the level of professionalism one wishes to reach, the process can take from a few years to a lifetime. Obviously, a few years of slacking will not advance one too much... on the contrary, hard work can yield amazing results. That is why achievement is not measured in years, but rather by results. Q: How do I transport a harp... in t-h-a-t four door sedan?! A: This is one of the most impressive parts of each performance. The grand finale stunt at the conclusion of a concert used to be maneuvering the harp through the back door to fit into an ordinary car. It is much easier now that I own a "harp mobile," in other words, a minivan. But the truth is, once the harp is inside a four door car it is very secure, and I can be sure it will not slide or move anywhere. I know it doesn't look or sound possible given the dimensions of a harp, but believe me, it fits in without a scratch!